Russian manned lunar lander. Study 1970. 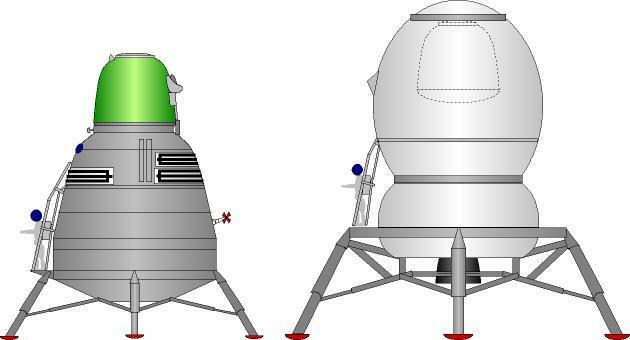 The first design of the L3M lunar lander had the crew of two accommodated in a Soyuz capsule atop the lander. Status: Study 1970. Gross mass: 23,000 kg (50,000 lb). Height: 7.90 m (25.90 ft). Span: 7.30 m (23.90 ft). They would have had to don space suits to move to the pressurized toroidal crew compartment and land the spacecraft. Sufficient supplies existed for stays of 16 days on the lunar surface. The original draft project prior to 1970 for the N1M-L3M lunar landing complex anticipated use of a two-launch profile. On the first launch a Block R TB braking stage would be put on a translunar trajectory. The TB would place itself in lunar orbit. Next, the manned L3M lunar lander would be launched. This new spacecraft was much larger than the LK, with a mass of 21 metric tons landed on the lunar surface. The L3M would dock, tail-first, with the TB stage in lunar orbit. The RTB would act as a lunar crasher stage. The L3M would separate from the TB just over the lunar surface, then hover to a soft landing. The crew would spend up 16 days on the surface. Following completion of their work, the landing legs would be left behind, and the L3M would launch itself on a trans-earth trajectory. Just before arrival at earth, the crew would enter their Soyuz capsule, separate from the L3M, and make a lifting re-entry into the earth's atmosphere. It was felt that within the existing funding allocation of the original N1-L3 program, enough N1's would be available to support a series of landings in 1978-1980. In this earlier L3M, the Soyuz return capsule was perched atop the landing stage. A small toroidal crew compartment provided accommodation for space-suited cosmonauts to land the vehicle on the moon. Evidently the crew, which would have been limited to two cosmonauts, would be required to space walk from the Soyuz capsule to the toroidal chamber prior to the landing attempt. A return spacewalk would have to be made after ascent from the surface. This L3M had a landed mass of 21 metric tons on the surface, an ascent mass of 18 metric tons, a trans-earth injection spacecraft mass of 5 metric tons, and sufficient supplies for 14 to 16 days of operations on the surface. Family: Lunar Landers, Moon. Country: Russia. Spacecraft: DLB Lunar Base, L3M. Launch Vehicles: N1M, N1, N1F, N1 1969. Agency: Korolev bureau. Bibliography: 288, 367. 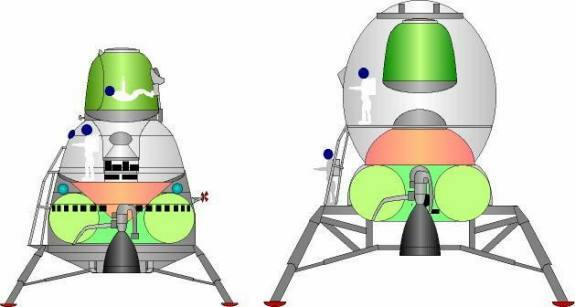 External views of early and later L3M manned lunar lander designs. 1970 During the Year - . N1M-L3M lunar landing complex draft project - . Nation: Russia. Spacecraft Bus: L3M. Spacecraft: L3M-1970. 1970 June - . LV Family: N1. Launch Vehicle: N1F. Development of engines for N1F authorised - . Nation: Russia. Spacecraft Bus: L3M. Spacecraft: L3M-1970.